When Mariam, a young Tunisian woman, is raped by police officers after leaving a party, she is propelled into a harrowing night in which she must fight for her rights even though justice lies on the side of her tormentors. 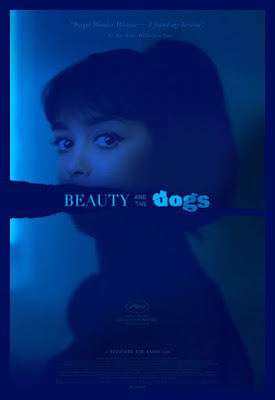 Employing impressive cinematic techniques and anchored by a tour-de-force performance from newcomer Mariam Al Ferjani, Kaouther Ben Hania's "BEAUTY AND THE DOGS" tells an urgent, unapologetic, and important story head-on. A rare, startling film that is a striking critique on a repressive society and a forcefully feminist rallying cry. Written and directed by Kaouther Ben Hania. Produced by Habib Attia and Nadim Cheikhrouha. Cinematography by Johan Holmquist. Starring Mariam Al Ferjani, Ghanem Zrelli, Noomane Hamda and Mohamed Akkari. An Oscilloscope Laboratories release.